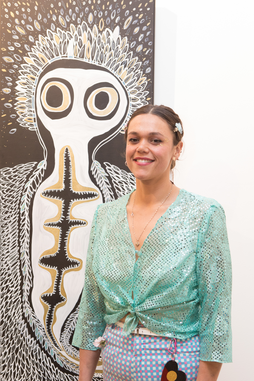 My name is Maddison Gibbs, I am a proud Barkindji woman and grew up in Dubbo, NSW. My artworks are based on my culture, people and surroundings, they tell stories of past and present by using contemporary methods and ideologies. My works include political statements and educational information regarding Aboriginal issues, a subject which I am extremely passionate about. I use different mediums for my works including drawing, ceramics, printmaking and animation. I am currently studying a Bachelor of Animation at the University of Technology. I have completed my Certificate III Aboriginal and Torres Strait Islander Cultural Arts at Eora College and I am also completing Certificate IV this semester. My latest works include a design entered in the Vivid Light Show and working on restoring the 40,000 years mural at the Block, Redfern. I am always updating my art collection and pushing my Artistic boundaries.